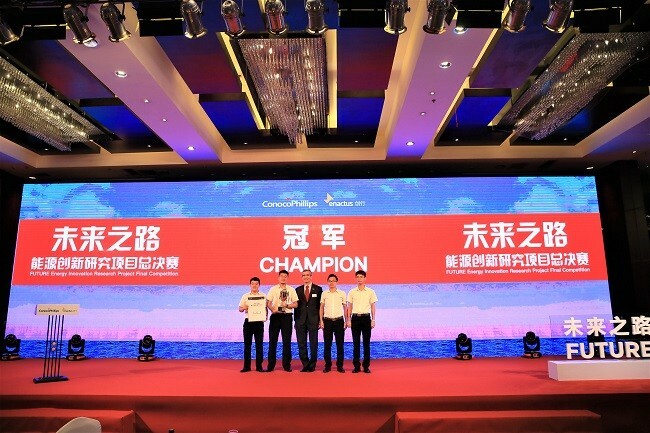 BEIJING – ConocoPhillips China (COPC) today announced continued partnership with Enactus China on the launch of the second “FUTURE” Energy Innovation Project (FUTURE). The project focuses on encouraging promising Chinese postgraduate students to pursue research studies in the oil and gas industry, with the aim of cultivating talents that will provide innovative solutions and tackle industry challenges along China’s economic development, contributing to sustainable development of the energy sector in China and the world. With more than 38 years of history in China, ConocoPhillips puts great emphasis on sustainable development, which requires the company to not only to seek productivity and economic benefits, but also to develop oil and gas resources in a high-efficient and eco-friendly way. In China, the exploration, development and utilization of complex oil and gas resources is among the five priorities of the key energy areas outlined by National Medium- and Long-Term Science and Technology Development Plan (2006-2020). With the increasing difficulty and cost of development, the exploration and development of compartmentalized reservoirs has become one of the key challenges for the oil and gas industry in China. With cutting-edge technological innovation capabilities, ConocoPhillips has leading technological expertise and unique insights on using the technologies of high-resolution reservoir characteristic (i.e. compressive seismic imaging), horizontal wells, multi-lateral wells, data analytics and formation stimulation etc. to develop the compartmentalized reservoir. The research topic this year – the exploration and development of compartmentalized reservoir– aims to take ConocoPhillips’ technological advantages and promote talent cultivation and technological innovation in fields that are relevant for meeting China's increasing need for high-efficiency exploration and development of compartmentalized reservoirs. Built upon the successful experience in 2018, the second “FUTURE” project will invite research teams from 10 targeted colleges and universities nationwide to participate and submit their solutions. All research papers will be reviewed and evaluated by academic consultants and industry experts from partner institutions based on their research originality, technical contents, applicability and environmental sustainability. The eight teams whose papers have the highest scores will qualify to participate in the national competition. During the months of rigorous evaluation process, senior technical experts from COPC will visit partner universities in various cities across the country to have face-to-face communication with young students and academic advisors to provide career development advice and opportunities. They will also be invited as mentors to provide professional guidance for the finalist teams during their preparation for the “FUTURE” national competition that will be held in September 2019. The final winning team will be invited to participate in Enactus China GO FOR THE FUTURE Expo in May 2020, where the team will present its research results on behalf of the young talents in the energy sector and have networking opportunities with academic professionals and corporate executives. *The schools are ranked in alphabetical order according to their original Chinese names. ConocoPhillips is the world’s largest independent Exploration and Production (E&P) company based on production and proved reserves. Since the early 1980s, ConocoPhillips has been China’s committed partner and one of the largest foreign investors in China’s upstream oil and gas sector. For more than 38 years, ConocoPhillips has expanded its overall business scope in China across various fields, including oil and gas exploration and production, LNG supply and other relevant business services. At present, ConocoPhillips has offices in Beijing and Tianjin (Tanggu). For more information, go to www.conocophillips.com. Enactus is a community of student, academic and business leaders committed to using the power of entrepreneurial action to transform lives and shape a better, more sustainable world. Enactus currently operates in 36 countries around the world, involving 550 companies and 1,730 universities. In China, Enactus established its Social Innovation Program in 2002. After 16 years of operation, Enactus China now has 291 universities from 26 provinces or municipalities (including Hong Kong and Macau) participating in the program. For more information, go to www.enactuschina.cn.